Ductwork is an integral part of any home heating, cooling and ventilation system. Without clean ducts, not only will your system be unable to distribute heated or cooled air evenly, but contaminants and dirt will be cycled through your indoor air over and over again. That’s why it’s so important to have your ducts cleaned on a regular basis. 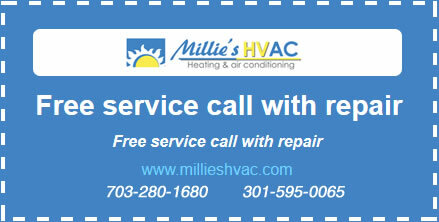 Call Millie’s Heating & Air Conditioning today for duct cleaning services in the Arlington, Virginia area. If you’re having trouble with your home’s heating and cooling system or overall indoor air quality, call us today to learn more about your options. Did you know that you can lose a lot of your heating and cooling through leaks in your duct system? You can check your ductwork for leaks by looking for dirt streaks on the ducts. If you notice that you have air leaks in your system, call a professional to have your ducts sealed and repaired. While it might seem like a small change, it can really make your heating and cooling system more effective, saving you money and energy! Every year, your ductwork moves thousands of cubic feet of heated and cooled air from your heating and AC systems to the individual rooms in your home. But, all that moving air carries with it a number of contaminants ranging from simple dust and pet dander to mold, bacteria and viruses. As the air travels from air handler to vent and back and again, deposits can build up in the joints and ductwork. If these deposits of dust, dirt and pathogens are not removed on a regular basis they can cause a variety of issues inside your home. Most notably, these contaminants will eventually recirculate into your home. If you don’t have an air cleaning or filtration system, you’ll be breathing unclean air on a regular basis because of those dirty ducts. If the buildup gets bad enough, your ductwork will become less efficient at passing heated or cooled air from one end of your home to the other. This forces your air conditioner or furnace to work harder to meet the demands set by your thermostat. This will cost you money each month and will lead to an increase in repair bills and earlier than necessary system replacement. For duct cleaning to be done properly, you need to call a professional who has the equipment required to reach every nook and cranny of your ducts. Simply removing air vents and vacuuming out the dust and debris you can reach isn’t enough. You need a professional who has access to high powered suction equipment to remove large deposits of debris from your ductwork. Our technicians will remove your vents, clear out every square inch of your ductwork and check the pressure to make sure no other duct service is needed. Duct cleaning should be completed on a regular basis – every one or two years – to ensure contaminant buildup doesn’t ever get out of control. Call Millie’s HVAC today to learn more about our duct cleaning services. If you live in the Fairfax and Loudoun County area, we can provide you with regular duct cleaning designed to keep your home comfortable, safe and properly heated and cooled throughout the year. Don’t go through another year with stuffy air, inefficient ducts and high energy bills – call us today.